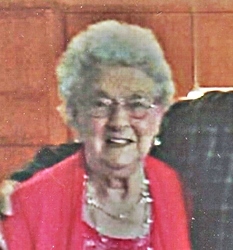 Deloris V. VanderSchuur, age 92, of Byron Center, went to be with her Lord and Savior on Saturday, April 13, 2019. She was preceded in death by her grandson, Jason Bolthouse; parents, William and Luella Seward and Grace and Jacob VanderSchuur; sisters-in-law and brothers-in-law, Myrtle (Walter) Shamery, Thelma (Benjamin) Groendyk, Eleanor (Fred) Harbison, Robert (Eva) Vander Schuur, and Marvin VanderSchuur. Deloris will be lovingly remembered by her husband of 73 years, Harold; daughter, Debra (Dan) Bolthouse; son, Scott (Sally) VanderSchuur; three grandchildren, Joshua (Stacy) Bolthouse, Sarah (Shawn) Raymond, Amanda (Bryon) Senzig; six great grandchildren; sisters-in-law and brothers-in-law, Patricia VanderSchuur, Lois (John) Spoelman; many nieces and nephews. Deloris was a lifetime and charter member of Maplelawn Baptist Church where she not only met the love of her life as a young child but also forged countless lifetime friendships. Funeral Services will be held 11 am Friday, April 19, at Maplelawn Baptist Church, 124 Maplelawn St. SW, with Rev. Andrew Willis officiating. Interment will be in Chapel Hill Memorial Gardens. The family will greet visitors on Thursday, April 18 from 5 – 8 pm at Stroo Funeral Home and on Friday, April 19, from 10 – 11 prior to the service at the church. Contributions in memory of Deloris may be made to Maplelawn Baptist Church. What a day of rejoicing it will be! Thank you Lord for my family and the gift you have given us in Aunt Lori. Uncle Harold we love you and our prayers are with you.